Chewacla State Park offers 696 acres of scenic glory! Located in Auburn, Alabama, immediately off I-85 at Exit 51, the park features a 26-acre lake, a swimming area, playground, modern campground, picnic areas with tables, grills and shelters, cabins, and plenty of mountain biking and hiking trails. Chewacla offers a variety of accommodations options for every level of “camper.” For those who prefer a roof over their heads, the park features six stone cottages available for rent year-round. Each cottage features hardwood floors, stone fireplaces, bathrooms, modern kitchens, and televisions, plus central heating and air (if you ask us, that last one may be the most important). Smaller cabins can house up to four people while the larger ones can sleep up to six. If roughing it is more your style, you’ll find 36 full-hookup camping sites and nine primitive sites within the park, all with shower facilities available. There is also a group camping area available for groups of 20 or more which includes a half bathroom, two pavilions with picnic tables, and a fire ring. 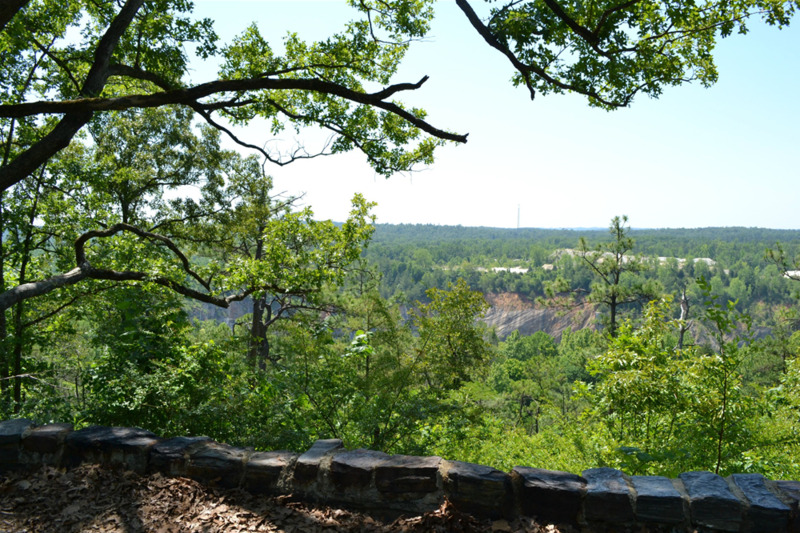 If you’re looking to stay nearby but not actually inside the park, there are a variety of hotels, bed and breakfasts, and RV Parks located in and around Auburn-Opelika. Lake Chewacla is perfect for casting your line. Whether from the shore or by canoe or kayak, anglers can reel in bream, largemouth bass, crappie, sunfish, and catfish. Or try your luck in the park’s two creeks. Fishing is allowed with an Alabama Fishing License, and although no motorized boats are allowed on the lake, the park does offer rentals of canoes, kayaks, and paddle boards for $7 per hour. Call 334-887-5621 ahead to ensure availability. Whether you’re a mountain biking expert or novice, there’s a trail for you in Chewacla State Park, and lovers of hiking will have plenty of options worth lacing up those boots for, too! While on the 30+ miles of trail, hikers and cyclists are likely to see plenty of wildlife such as squirrels, chipmunks, red fox, white-tailed deer and wild turkeys, plus distinctive rock formations and a variety of native flora and fauna. Thanks to the Central Alabama Mountain Peddlers (CAMP) whose volunteer efforts have resulted in over 30 miles of gnarly single-track, beginner and advanced mountain bike riders will find plenty of diversity in their rides. Park features include a skill development area, rowdy cross country, sweet flow trails, dialed dirt jumps, and the newest “Forbidden Zone:” a series of 25 death-defying jumps featuring the largest gap jump in the Southeast! Birding enthusiasts will rejoice at the feathered friends they spot at Chewacla State Park. Throughout the park are a variety of woodland songbirds like Summer Tanagers, Wood Thrushes, and American Goldfinches. Other resident birds to be found here include Eastern Phoebes, Cedar Waxwings, American Robins, Hermit Thrushes, Brown-headed Nuthatches, Pine Warblers, as well as Louisiana Waterthrushes and Acadian Flycatchers nesting along the creeks and Northern Parula, Yellow-throated, and American Redstart Warblers throughout the warmer months. Geocaching is a modern-day treasure hunt that’s fun for the whole family! Geocaching is a way for kids and adults of all ages to discover and explore places. It’s a high-tech scavenger hunt you play by using your handheld GPS or smartphone to navigate to geocaches around the world – including in Chewacla State Park! To get started, just head to Geocaching.com or look for the iPhone or Android app in your app store.